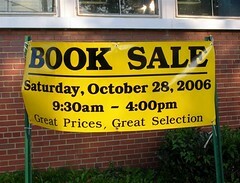 What: The Friends of the Woodridge Library used book sale. We (disclosure: I am a member of the Friends - we'd love for you to join our group!) have hardcovers, paperbacks, fiction, non-fiction, books for adults, books for children, books on tape, records, videos/DVDs, and much more. All proceeds benefit the Woodridge Library. Etc. : We are always accepting donations of books, videos/DVDs, records, comic books, and the like. For additional information call the library at 202.541.6226 or e-mail the Friends at woodridgefriends@yahoo.com. For additional information please call the Ward 5 Council Office at 202.724.8028. On Friday, October 27, 2006 at 1:00 pm, Councilmember Kathy Patterson, Chairperson of the Committee on Education, Libraries and Recreation, will hold a public oversight hearing on the Martin Luther King, Jr. Memorial Library. This meeting has been rescheduled from its’ original date of October 16, 2006. The purpose of the hearing is to examine the feasibility of the Carnegie Library site to serve as the location for a new central library for the District of Columbia [yes, yes, please - what a fabulous option!]. The Committee wishes to examine this option from programmatic, architectural, and financial perspectives. The public hearing will begin at 1 p.m. in the Room 412 of the John A. Wilson Building at 1350 Pennsylvania Avenue, NW. The Committee invites the public to testify or to submit written testimony, which will be made a part of the official record. Anyone wishing to testify at the hearing should contact Evelyn Bourne-Gould, Legislative Assistant to the Committee on Education, Libraries and Recreation, at 724-8195, or via e-mail at egould@dccouncil.us. All witnesses will be permitted a maximum of three (3) minutes for oral presentation. If you are unable to testify at the hearing, written statements are encouraged and will be made a part of the official record. Copies of written statements should be submitted either to the Committee on Education, Libraries and Recreation, or to Ms. Phyllis Jones, Secretary to the Council, Room 5 of the Wilson Building, 1350 Pennsylvania Avenue, NW, Washington, DC 20004. What: Teens are invited to share their thoughts on The First Part Last by Angela Johnson, Coretta Scott King Author Award winner. This novel is about a teenage father and his struggles to raise his child. All are welcome - even if you haven't read the book, the discussion will be of interest! The first DC ANC Citizen Conference will be held at Turkey Thicket Recreation Center located at 1100 Michigan Avenue, NE, from 5-9pm on Monday, October 23rd, 2006. Opening remarks will come from Mayor Anthony Williams, Chairman of the Council Linda Cropp, and Councilmember Vincent Orange. Discussion will commence from the Director of the Office of Advisory Neighborhood Commissions, Gottlieb Simon. There will be an ANC panel discussion moderated by The Washington Informer publisher, Denise Rolark Barnes. Issues will pertain to zoning, ABRA, and EMA. All are invited to attend. The Coalition of Concerned Neighbors can be contacted at 202.903.6197 or concerneighbors@yahoo.com. 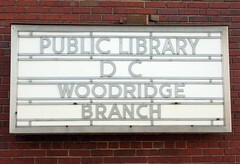 You may have heard that all DC Public Libraries, with the exception of the Deanwood Kiosk, are now wired for free Wi-Fi. The exceptions are the four small community libraries and the Deanwood Kiosk, which will continue to be open Monday through Friday. "Sundays are generally when families spend the most time together so it’s great they will now be able to make their local branch library a family activity where every member can find something they enjoy," said Ginnie Cooper, the D.C. Public Library’s Chief Librarian. "Whether it’s families or individual residents, we’re going to be attracting groups of people who wouldn’t normally have time to come to the library during the week. This is going to enable us to serve many, many more people who have information needs but perhaps did not have time to get their needs met." In addition to the new hours, Chief Librarian Ginnie Cooper announced that beginning immediately there is no longer an age limit for children to obtain a library card, and no longer will there be a children’s handwriting requirement for a child to apply for a card. Now, parents and guardians may apply for a library card for very young children and it will be issued in the child’s name. Cooper says this change will help to encourage children to read at a younger age, which is a hallmark of her library philosophy. She continued by saying, "Our former policy is historically common, and may still exist at other libraries. 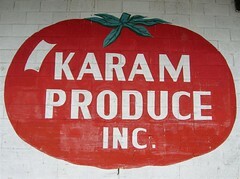 I have had the pleasure of changing similar policies at other places." We are definitely taking baby-steps in the right direction. The Woodridge Library, 1801 Hamlin Street, NE (at the corner of 18th and Rhode Island Avenue), invites young adults and parents to meet Melinda Robertson, author of "Motherhood...What You Don't Know! ", for a discussion and book signing this Friday, October 20th, 2006 at 5:30pm. "The book serves two purposes. One to show how complex motherhood really is, as it is intended to provoke young women to think about what it would really mean to have a baby. Secondly, Nicole, the main character, can be an encouragement to the thousands of teenage mothers raising children today, because [of] the 'straight talk, no chaser' conversations Nicole's mother has with her...."
Woodridge is also hosting an adult book discussion on Tuesday, October 24th, 2006 at 2pm. Come and bring your favorite book to share with others - all are welcome! Participants in the Adult Summer Reading Program will discuss the books they've read. Preschool storytime (ages 3-5) is scheduled for Thursdays at 10:30am. Call the Woodridge Branch for additional information on these and other programs at 202.541.6226. The Metropolitan Police Department is seeking the public’s assistance in locating a missing person identified as Cherita Gladden. She was last seen leaving her home address located in the 200 block of 35th Street, NE at about 8:00 am on Wednesday, October 4, 2006. Cherita is fourteen years old. She is described as a dark complexioned black female, 5’2’ tall, weighing about 160 pounds, with brown eyes and black hair worn in braids. She was last seen wearing a white shirt, a white jacket, blue and pink pants, and a Dallas Cowboys baseball cap. 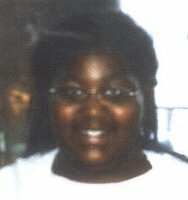 Anyone who has information regarding Cherita Gladden’s whereabouts is asked to call police at (202) 727-9099. Warning: I don't mean to be insensitive to any one else's pain, just truthful....Now that Michelle Gardner-Quinn's body has been found, could we get a little local coverage for this missing child? Cherita returned home Monday, October 16th, but the lack of media coverage has caused a bit of a stir. I've been following the story of Luis "Quike" Morales at Frozen Tropics. After leaving work at the Argonaut Tavern, Morales was shot in the head outside his girlfriend's home in the 600 block of 14th Place NE at 5:30am September 30th. 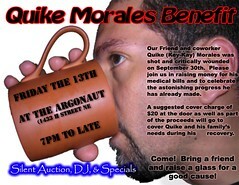 The Argonaut, at 1433 H Street NE, is hosting a benefit tonight, starting at 7pm, with a silent auction and DJ in an effort to raise money to aid Morales and his family during his recovery. My prayers go out to them during this difficult time. Both Richard and Elise have posted a wealth of information on the tour they're hosting this Saturday. I've gone, I've enjoyed, and you should, too. Also, if you can, consider attending the public hearing Friday, October 20th, 2006 on proposed legislation for Bill 16-868: "New Town at Capital City Market Revitalization Development and Public/Private Partnership Act of 2006." The proposal intends to "create a public/private partnership between the District of Columbia and New Town Development, LLC for the purposes of economic, social, and cultural revitalization of a 24 acre site located in Ward 5." Richard and Elise have written extensively on the future of the Florida Market and what we could lose if New Town becomes a reality (searches on their respective blogs will bring up the relevant posts). Fire quickly spread through eight townhouses in Brentwood Sunday, displacing 41 people, most of them children. "That fire went from a single room to the entire row in less than five minutes," says D.C. Fire Battalion Chief Kevin Sloan. "The entire roof area became involved in less than five minutes." The 4 p.m. fire [at 2255 15th Street, NE], started in a third floor bedroom of a middle unit. While it did not go below the roof line of the building, all eight units of the renovated apartment building sustained some water damage. Firefighters had some difficulty fighting the fire because the building had a tarred flat roof that was covered by a pitched roof. The tar on the roof spread the fire quickly. There also was concern that the roof would collapse. 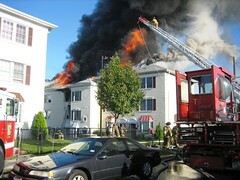 About 100 firefighters battled the blaze. "Because of low water pressure in some areas, we weren't able to put all of our lines in service," says Deputy Fire Chief Kenneth Ellerbee. Sloan says one man was injured when he jumped from third floor of the unit where the fire started. His injuries are not life-threatening. Why, oh why, was the water pressure so low that the fire department couldn't do their job? At approximately 11:30 pm, on Tuesday, October 10, 2006, Metropolitan Police were called to the front of a building located in the 3100 block of 10th Street, NE, to investigate the report of a shooting. Upon arrival, officers located 28-year-old Eddie Watkins, of the 3100 block of 10th Street, NE, suffering from apparent multiple gunshot wounds to the head and body. DC Fire and Emergency Medical Services personnel responded to the scene, but found no signs consistent with life. He was taken to the Office of the Chief Medical Examiner for the District of Columbia and pronounced dead. The case is under investigation by members of the MPDC's Violent Crimes Branch. Anyone with information about this case is asked to call police at (202) 727-9099. The department currently offers a reward of up to $25,000 to anyone who provides information that leads to the arrest and conviction of the person or persons responsible for any homicide committed in the District of Columbia. On Tuesday, October 10, 2006, at approximately 4:25 pm, at the intersection of 8th Street and South Dakota Avenue, NE, 20-year-old Jonas Lee Underwood, of the 4900 block of 7th Street, NE, was the driver of a 1997 Chevy Monte Carlo making a left turn from westbound South Dakota Avenue NE, onto southbound 8th Street. As Mr. Underwood was making his turn, his vehicle was struck by a 2004 Chevy Avalanche being driven by 35-year-old Brian Omar Johnson, of the 1200 block of Delafield Place NE. The impact caused massive intrusion into the right passenger’s side of the Monte Carlo. Consequently, the right rear passenger of the Monte Carlo, identified as 16-year-old David Duarte, of the 5000 block of 54th Place in Hyattsville, Maryland, was transported to the Washington Hospital Center’s MedSTAR Unit, where he was pronounced dead 5:10 pm. Jonas Underwood was treated at the Washington Hospital Center for facial lacerations. The front seat passenger was treated at Howard University Hospital for head pain and facial cuts, and then released. The third passenger of the Monte Carlo was not physically injured. Brian Johnson and his two passengers in the Chevy Avalanche did not sustain any physical injuries. The case is under investigation by members of the MPDC's Major Crash Investigations Unit. Investigators have established that the intersection where the crash occurred is controlled by a stop sign for both northbound and southbound traffic. Therefore, the contributing factor in the crash is the failure to yield the right of way on the part of the operator of the Chevy Monte Carlo. While the accident may certainly have been caused by Jonas Lee Underwood's failure to yield, I've no doubt that the oncoming traffic was travelling much faster than the posted speed limit. My guess is that may have contributed to the intensity of the crash. Brookland, one of Washington DC's Main Street communities, will hold its 10th annual Brookland Day Festival on Saturday, October 7, 2006. The festival is a community-oriented event for all ages and it always captures and highlights the special small-town-in-town flavor of Brookland. At 11:00 AM, a parade featuring the Archbishop John Carroll High School Band and the Festival's spoof brigades of neighborhood residents, including phalanxes of dog walkers, lawnmower pushers, and baby stroller pushers, will march [on 12th Street] from Franklin Street to Michigan Avenue, NE. Between 12:00 PM and 5:00 PM, performance and exhibit pavilions, including nonprofit organizations, businesses, and arts and crafts exhibitors, will be featured in booths along Brookland's commercial district, on 12th Street, between Monroe and Otis Streets, NE. With Amanda Sweet as its Master of Ceremonies, the main stage on Otis Street will feature performances by The DC National Guard's Capitol Sounds, The Dance Place, The Archie Edwards Band, Benat Baharat, and The High Signs. Performances will start at noon. The Festival is sponsored by the National Capital Revitalization Corporation, Keller Williams Capital Properties, The Washington PostCitibank, DC Lottery, and PNC Bank. 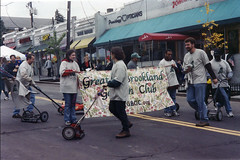 The festival is coordinated by the Brookland Community Development Corporation, the parent organization of Historic Brookland Main Street, the commercial district revitalization program working with property owners, business proprietors, residents, and other stakeholders to bring about focused improvements to the commercial district. For further information on sponsorship opportunities or to participate in any events, contact the Brookland Festival Committee by phone at 202-529-8400, fax at 202-526-0837 or e-mail brooklandcdc@aol.com. The Brookland Community Development Corporation (BCDC) is a 501(c)(3) nonprofit corporation that was created to promote the arts and to protect and capitalize on the cultural resources of the Brookland neighborhood for the purpose of building community pride and fostering responsible economic development. The BCDC is located at 3420 9th Street NE, Washington, DC 20017. The District of Columbia Water and Sewer Authority (WASA) has detected high nitrite levels in the drinking water at six properties served by a privately owned 8” water main along 8th Street NE that is not maintained by WASA. As a matter of caution, after consulting with the Department of Health, WASA is advising the occupants of these buildings near the intersection of 8th and Varnum streets N.E. not to drink the tap water [boiling will not help]. The affected properties include 4401 through 4415 8th Street NE and 831 and 832 Varnum Street NE. No other customers are impacted. WASA issued a similar notice on August 15, 2006 when high nitrite levels were found at some of these addresses during routine water quality monitoring. Nitrites are usually found in stagnant water and generated by the decomposition of organic material. The large size of the private water main and its low use are believed to be major factors in the high nitrite levels that were detected from the pipe. Elevated nitrite levels in tap water are a particular health concern for infants below the age of six months. WASA is arranging a meeting with District agencies and the impacted customers to determine the best course of action to resolve the problem. Meanwhile, as a precaution, WASA continues to regularly flush the line.